Maintaining civility is key to fostering innovation in today’s polarized environment. SUCCESS Partners in Plano Texas created an environment where employees can thrive. Photo by Kurt Griesbach, courtesy of Corgan. 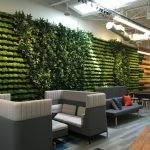 Recent articles and case studies in Work Design Magazine speak about a growing trend in office design: shifting from traditional enclosed work spaces to a more open layout. By removing the walls, it not only allowed for greater flexibility in how space was used but created an environment where people would have more daily interactions with their colleagues. This case for change is driven by needs of some in the workforce who are accustomed to doing their work in a variety of environments ranging from a stool at a Starbucks to a couch in their living room – as they did in college. Experts assert that by creating a design that increases the number of these chance meetings (commonly referred to as collisions), it would foster greater collaboration and the sharing of new ideas. Almost as important is how this also helps strengthen employee engagement. A global study conducted by Steelcase, the leading manufacturer of office furniture, found that employees who had more control over where and how they worked were more engaged. Which is why The Boston Consulting Group, a firm whose success depends on its ability to harness the power of the brightest minds, designed their new office spaces in New York City with these concepts in mind. BCG’s new offices in Manhattan’s Hudson Yards. Image courtesy of Contract Furnishings News. However, reaping the benefits from more collisions is complicated by today’s polarizing times. Numerous media reports state workers felt distracted and stressed on the job following the election of President Trump. Understanding what’s at stake and how to maintain an inclusive environment will help you avoid a messy pile-up. The incessant public debate about shifts in public policy since the election weighs heavily on everybody’s mind as they come to work. A survey conducted by The American Psychological Association in early January 2017 showed that more than half of Americans cited the current political climate as a significant source of stress, and two-thirds of respondents said they feel stressed about the future of the country. To ease this increased level of anxiety, some are venting on Facebook and Twitter while others are choosing to engage in discussions with co-workers. In both cases, the dialogue often revolves around sensitive topics that previously were considered too controversial for casual watercooler conversations. Not surprisingly, some of these exchanges have not been conducted in a civil and respectful way, placing the responsibility of protecting the peace in the hands of managers who are often ill-equipped to respond effectively. This is where companies with a diversity and inclusion strategy have an advantage because they understand that different points of view combined with having a culture that values everyone’s voice helps to fuel innovative thinking. While workplace guidelines are intended to serve as the standard for acceptable behavior in most organizations, creating a space that respects the individual requires a more comprehensive solution or you risk suffering the consequences. Before you know it, these discourteous interactions not only can serve to dilute collegiality and but research shows it impacts the bottom line. Productivity: According to the Anxiety Disorders Association of America, 56% of employees say stress and anxiety most often impact their workplace performance, as well as the quality of their work (50%). The result is an average of up to 7 hours per week in lost productivity. The report also states that one in three absences are a direct result of anxiety and/or stress in the workplace. Retention: Research conducted by Google found that employees on teams with more psychological safety were more likely to make use of their teammates’ ideas and less likely to leave the company. Engagement: Other studies show 60-80% of all difficulties in organizations come from strained relationships among employees. A 2017 report published by employee survey firm TINYpulse shows that collegial workplace environments make a difference in one’s engagement at work. In January, I wrote about the real-time challenges companies like Google, Marriott and Uber faced when employees wanted to know how the proposed Trump Administration travel ban would impact their livelihoods. For these and many other employers whose brand value proposition is based in part on their belief that diversity is a competitive differentiator, the pace of action and how you communicate is essential to protecting their well-earned reputations as a best place to work. At a time when social media can quickly amplify action (or inaction), Uber learned a painful lesson that it only takes minutes to raise doubts about an organization’s authentic commitment to diversity and inclusion. For those considering a more open layout for their office, expanding the universe of stakeholders, in the planning and execution process will well serve the overall process. Asking those that will ‘use’ the space what matters most to them also ensures that you leverage HR and all managers to communicate the objectives and how it helps to be known as the best place to work. Be proactive and acknowledge the fact that your employees may be feeling stressed: Whether you like it or not, these conversations are already occurring. Encourage managers to check-in with their teams even if they feel all is OK. It will be comforting to your employees that their well-being is a priority especially at a time of so much uncertainty. Guide behavior via workplace policies: When it comes to acceptable behavior in the workplace, make sure employees are aware of what’s expected by reminding them about workplace policies that guide conduct such as non-discrimination and anti-harassment. These can be applied to discussions of a political nature as well. Include a definition of what civility does and does not mean. Clarifying these boundaries will help empower employees to hold each other accountable to maintain the peace by engaging them in the process. Reinforce values: Your organization’s values are the fundamental beliefs and guiding principles that dictate behavior and action…and people pay attention to them. Use them as a framework for goal setting and to help remain focused should the political discourse become a distraction. Leadership should set the example: Not only ‘talk the talk’, but ‘walk the walk’ because it speaks volumes. When leaders model the behavior for others to follow, they demonstrate that their words have meaning which is especially impactful when they remain cool under pressure. Intervene when necessary: If you see a situation is getting out of hand, take control by pausing the conversation. It is important to remind the individuals about relevant policies guiding behavior as well as to reinforce any values related to valuing diversity. If you cannot find ways for them to work together productively, it may require involving human resources. Placing a value on open communications while still ensuring respect for the individual will not only create a safe space for these challenging conversations but will lead to better quality relationships and minimize the impact to the bottom line. With the current uncertain economic and political climate, thinking of how to improve employee’s morale in the office is important. If your staff become stressed and anxious, this will certainly have an impact on productivity, collaboration and the overall company’s environment.